Before traveling to Oman on the Kennedy-Lugar Youth Exchange & Study (YES) Program, Dylan Hoey had never left the United States. Yet through this YES Abroad experience, Dylan proved he could not only live in another country but thrive there. 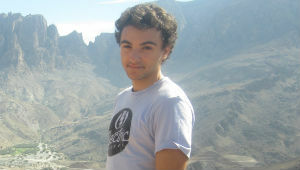 Dylan had a unique experience with his host family, who are Lawati Shia. They are Omani, but at the same time, they have their own traditions and different language. One of Dylan’s most memorable experiences was when he travelled with his host family and a few American friends to Dubai for New Year’s Eve. They went to the base of Burj Khalifa, the tallest building in the world. Despite this very different cultural experience, Dylan felt that his relationship with his friends in Oman was very similar to his interactions with his friends in the U.S.
Dylan advises all future YES participants to have an open mind when participating in the program. Dylan is grateful to the U.S. State Department and AMIDEAST, the in-country hosting organization, for making this program possible.